Los Angeles Unified School District and United Teachers L.A. reached an agreement last night, now ratified by union members and ended the teachers’ six-day strike. 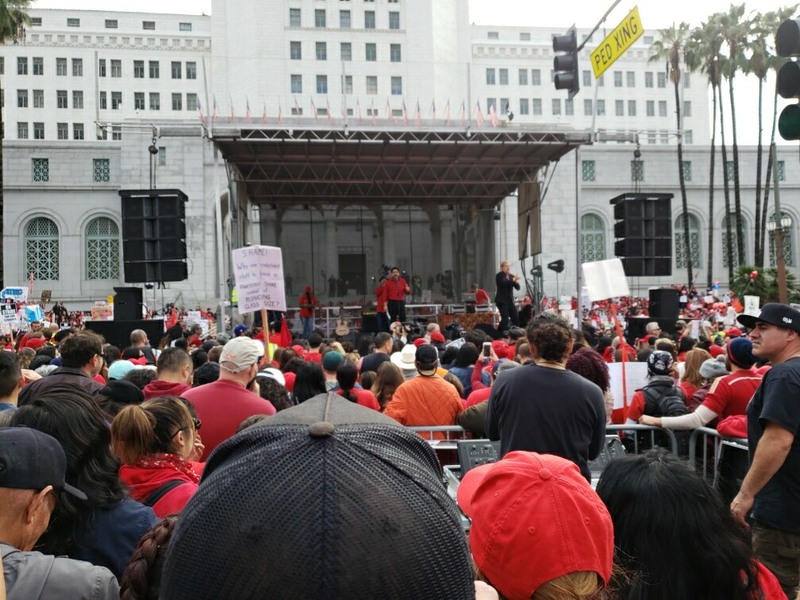 Thanks to the strike, UTLA’s first in 30 years, teachers will return to their classrooms Wednesday with promises to reduce class sizes, establish community schools and hire more necessary staff, such as counselors and nurses. It’s a major victory for teachers and students. 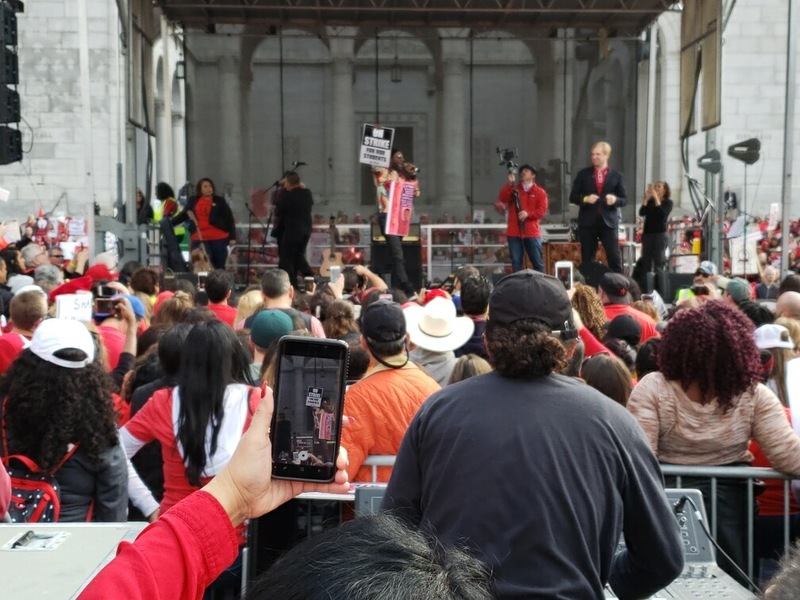 While many media outlets are accurately reporting on how historic of a win this strike is for UTLA, less attention is being paid to a group that helped ensure their victory — the students themselves. Students walked out with teachers, picketed at schools, spoke at rallies and marched in demonstrations. Their role in the strikes denied LAUSD the ability to drive a wedge between students and their teachers by accusing teachers of self-interest and neglecting their students. It also demonstrated to political pundits that students were not only aware of the issues being discussed in union-district negotiations, but also that they were invested in resolving them. “Large class sizes impede our ability to learn, less testing would give students more time to learn from their teachers, more nurses and social workers would mean I don’t have to choose the day I sprain my ankle or have issues at home that I need to talk to a professional about,” said Monroy. Students played a crucial role in influencing change in America’s second-largest school district. In a time when our society and our politics seem to be in perpetual free-fall, LA’s students should stand as a testament to all students, whether they wear the activist label or not, of what students can achieve. L.A.’s students demonstrated what happens when they disregard the self-limiting “don’t get political” narrative forced on them by both school administrations fearing parent backlash and media institutions that view civility as excluding of activism. They stand as an example of students who, when confronted with institutional challenges in the classroom and in the district offices, chose to invest their time and effort in working to improve their education system for themselves and future students. They could have let teachers go it alone, to face down public opinion and the school district as they fought for reforms that could change the face of L.A. public schools. Instead students chose to march alongside them and fight for the future. They stand as an example of students who are willing to go deeper than the “activists” who post inspirational quotes on social media: Amee, Dixon and others made a conscious decision to participate in and take a leading role in strikes, even as the district sent out differing signals about how student absences would be treated. And because of them, LAUSD is on track to implement reforms that, due to LAUSD’s size, will be imitated on a national scale. L.A.’s students chose to take a stand and engage in the political process, and the result is longstanding change for their district and America as a whole. What other students should learn from L.A.
Every student, whether they go to public school or not, should see L.A.’s student body as an example of how getting political and getting involved in trying to solve their own school’s problems is worthwhile. Even as more and more students take up activist causes at the national level –– gun violence, climate change and national policy issues — there’s still an aversion to challenging the local system. Every high schooler can attest to the feeling of inevitability that comes with problems such as overloaded classes, sub-par resources (or a lack thereof), and outdated curriculums. School board meetings often drag on for hours and seem designed with the intention of decreasing broad student engagement. Most school administrations seem intent on stomping out “political” discussion before it even occurs. L.A.’s students did it — they ran with the issues and invested in solving them. They took a stand alongside their teachers against the superintendent and his allies. And they won. Let that be a lesson for every student in America who wonders if their school will ever fix its problems. This article originally appeared on Micah Wilcox’s blog, DigiKlatch.